Two weeks ago it was Palestinian militants who abducted a legitimate military target, an Israeli soldier. On July 12, it was a similar overwhelmingly orchestrated heroic attack by Hezbollah guerrilla fighters. Both attacks are there to send a message of resistance: Israel will never succeed in imposing its sickening unilateral notion of 'peace'. Indeed, the unilateral disengagement may have had a magical effect on the Israeli voters as well as some Zionised western leaders such as Bush, Blair and Merkel. Yet, the inhabitants of Gaza and the villagers of Southern Lebanon are slightly less impressed with the Israeli inclination towards peace. In Gaza and in Southern Lebanon it is rather clear that Arab resistance forces will oppose the Israeli unilateral agenda til the end of time. They all know that as much as it takes two to tango, peace will never prevail unless the Palestinian cause is properly addressed. In short, the different forms of Israeli unilateral disengagements from Lebanon, Gaza or even the West Bank (to come) are not going to provide Israel with peace. Quite the opposite; Arabs are no fools, they know very well that Israel escaped Lebanon after being militarily humiliated for two decades. They know as well that Sharon ran away from Gaza not exactly because he was searching for peace. Palestinians also know that it is just a question of time before that happens in the West Bank. If to be precise, since 1973 Israels power of deterrence is shrinking. Since 1973 Israel hasnt managed to defeat any of its enemies. On the contrary, time after time it is the enemies of Israel who are able to dictate Israeli political and tactical manoeuvres. In the last two weeks it has been two relatively small paramilitary organisations who use guerrilla techniques who managed to bring Israel to unleash its full military might against innocent civilians both in Gaza and Lebanon. Yet, the Israeli reaction to attacks by Palestinian militants and Hezbollah is rather bizarre. Although, both Palestinian militants and Hezbollah were originally targeting legitimate military targets, Israeli retaliation was clearly aiming against civilian targets, civil infrastructures and mass killing directed against an innocent population. It doesnt take a genius to realise that this is not really the way to win a war or confront that particular sort of combat known as guerrilla warfare. I would argue that once again the Israeli government serves us with a fascinating glimpse into the mindset of the Israeli collective psyche. I will try to elaborate on this issue. Due to some clear historical circumstances, the Israeli army was originally formed to combat Arab armies. It was designed to win conventional war in the battlefield. It was set up as well to exhaust Israels neighbours will to fight while exercising some overwhelming air superiority and nuclear threatening policies. Since the end of the cold war, things changed. Israel isnt threatened anymore by its neighbouring states. Moreover, in the most recent years it has become clear that it is actually the Palestinian people who will eventually shatter the dream of a Jewish national state. Strangely enough, Israel has never adopted or revised its military doctrine to fit into the new emerging conditions. Indeed it retrained large parts of its fighting units as policing forces, it transformed some of its tanks into policing vehicles. Yet, it has never gone through a vast military doctrine shift. Very much like the Wehrmacht at the time of WWII, the IDF (Israel Defence Force) is still a classic follower of the offensive military doctrine. Hitherto, rather than winning in the battlefield, the IDF is now hopelessly exhausting itself in two fronts fighting relatively small paramilitary organisations. But the situation can get worse, it is rather possible that Palestinian heroic enthusiasm will spread to the West Bank. When this happens, the IDF will find itself engaged in a total war just a few kilometres from Israels most densely populated centres. Seemingly the so-called strongest army in the Middle East is fighting a desperate war it can never win, neither tactically nor morally. the stronger the Hamas becomes. Tactically, we have enough historic references to conclude that no colonial army has ever won against guerrilla warfare. The reason is simple, the more destruction a colonial army spreads, the more popular the guerrilla fighters become amongst their surrounding supportive population. This is absolutely the case in Gaza and in Beirut today. The more carnage there is in Gaza, the stronger the Hamas becomes. The more bombs dropped over Beiruts Airport, the more will young men be willing to join the Hezbollah. 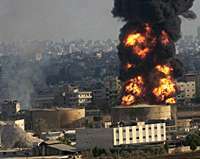 But it goes further, both the Palestinian militants and the Hezbollah were very clever in picking pure military targets. While in the past, the Palestinian paramilitary groups were typically associated with suicidal attacks against Israeli civilians, this time it was Israeli soldiers and pure military posts that were targeted. In other words, it is rather impossible to dismiss the fact that Palestinian militants and the Hezbollah were actually operating as legitimate resistance paramilitary groups fighting a colonial army and occupation forces. However, reading the news from the Middle East, it is rather obvious that the Israeli government has no clear agenda to counter the current daring military operations against its army and if this isnt enough, the IDF has no means to counter such guerrilla assaults. Todays merciless collateral damage in Beirut as well as in Gaza proves that at least militarily, Israel is in total despair. It has neither the political nor the military answer to counter Arab resistance. But here comes the catch; Israel doesnt need an answer as such, it doesnt even look for one. suited to get on with your governing job. Israel is a racially orientated democracy. Its leaders are engaged in one thing only, that is, maintenance of their political power. As far as the Israeli political game is concerned, the rule is very simple, the more Arab blood you have on your hands the more you are suited to get on with your governing job. This rule obviously was in favour of Rabin, Sharon, Barak and Netanyahu. Olmert and Peretz are still quite far behind. Both the prime minister and his defence minister lack some real experience in military and security matters. Hence they have a lot of catching up to do. In other words, Peretz and Olmert have to provide the Israeli people with a glorious spectacle of merciless retaliation. They have to prove to their keen voters that they have internalised the real biblical meaning of an eye for an eye. Looking at the carnage in Beirut today it somehow seems as if they even try to give the old Hebraic saying a new meaning. As devastating as it may sound, this is exactly what the Israelis want them to do. Within democratic Israel the biblical call "pour out your fury upon the goyim" is translated into a Jewish secular pragmatic political practice. This isnt sad. This is a real tragedy. And I wonder whether there is anyone out there who is still overwhelmed with the Israeli unilateral peace agenda? Note: Those with strong stomachs who want to see uncensored pictures of the Israeli onslaught on Lebanon, click here. Note: Gilad Atzmon was born in Israel and served in the Israeli military. He is the author of two novels: A Guide to the Perplexed and the recently released My One and Only Love. Atzmon is also one of the most accomplished jazz saxophonists in Europe. His recent CD, Exile, was named the year's best jazz CD by the BBC. He now lives in London and can be reached at: atz@onetel.net.uk. Click here to order Gilad Atzmon's CDs and books. March 29: Hamas wins January's democratic election in occupied Palestine. Prime Minister Ismail Haniyeh sworn in. The US and Israel and their western allies refuse to accept the results and punish Hamas by witholding funds to run the Palestinian civil services. June 9: Israel shelled a beach in Beit Lahiya killing eight civilians and injuring 32. June 13: Israeli aircraft fired missiles at a van in an attempted extrajudicial assassination. The successive barrages killed nine innocent Palestinians. June 20: Israeli aircraft fired at least one missile at a car in another attempted extrajudicial assassination attempt on a road between Jabalya and Gaza City. The missile missed the car. Instead it killed three Palestinian children and wounded 15. June 25: Palestinian freedom fighters raid Israel border, killing two soldiers and capturing Cpl Gilad Shalit. June 28: Israeli troops move into Gaza to find the captured soldier. June 29: Israeli troops arrest one-third of the Palestinian cabinet and almost two dozen Hamas members of parliament. July 3: Israeli army moves into northern Gaza after Hamas fires a rocket at the Israeli city of Ashkelon. July 12: Israeli armour moves into Khan Younis. Israeli air raids kill family of nine Palestinians. Since June 28, 70 Palestinians have died from Israeli attacks. At the same time, Hezbollah in Lebanon launches rockets into Israeli army posts in the disputed Shebaa Farms area and the Israeli town of Shlomi. They also seize two Israeli soldiers in a cross-border raid. Eight Israeli soldiers are killed. Hezbollah says they want Israel to release Palestinian prisoners in Israel for the two soldiers. July 13: War starts. Israeli jets bomb three runways at Beirut's civilian Rafik al-Hariri International Airport. Israel's navy blockades Lebanon's coast. Since July 13, the war has not stopped. There are hundreds of casualties among the Lebanese civilian population and destruction of property and infrastructure. Lebanon's prime minister said July 19 that 300 people have been killed, 1,000 have been wounded and a half-million displaced. U.S. President George W Bush "OKs" the invasion.